Only a few hours from the hustle and bustle of Toronto you’ll find the Niagara Region–home to over 80 wineries and numerous notable restaurants showcasing the unique flavour of the land. It would certainly take you several trips to visit them all, but there’s one you’ll definitely want to put at the top of your list. Tucked away in the small town of Niagara-on-the-Lake among the lush greenery and bountiful farms is Peller Estates Winery and Restaurant. When you pull up to the winery with you’ll feel like you’ve just arrived at an estranged rich Uncle’s estate. Its modern Victorian style architecture gives it a classy elegance that feels warm and comfortable. The inviting entrance of Peller Estates Winery. While Peller Estates is firstly known for its exceptional wine, it is also home to an award-winning restaurant. Peller Estates Winery Restaurant has been awarded the CAA 4 diamond rating, the Golden Plate Award from Le Clefs d’Or, and has received recognition from popular online review sites such as TripAdvisor, OpenTable, and Zagat. What makes this restaurant extraordinary is its team of chefs led by Executive Chef Jason Parsons. 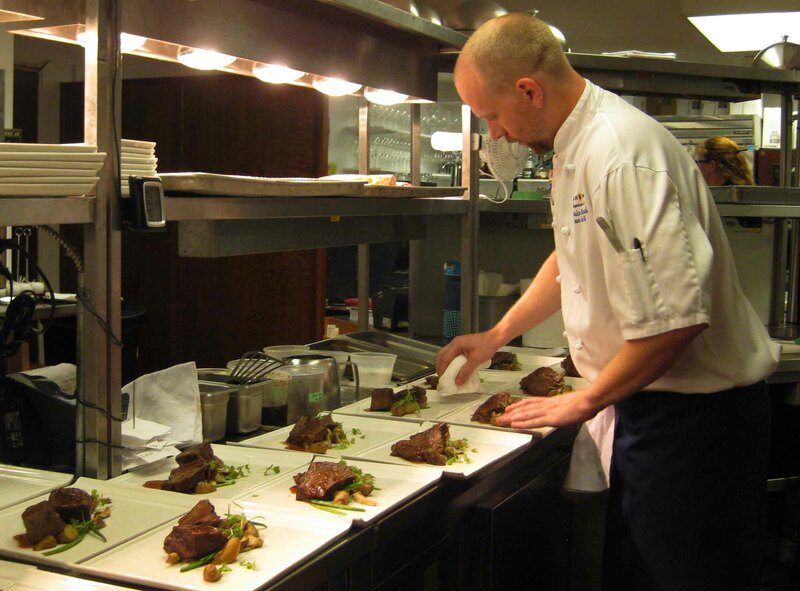 When Chef Parsons joined Peller Estates a little over ten years ago, he brought with him 20 years of experience from around the world. This experience developed a strong respect to the importance of a sense of place that would help him shape a one-of-a-kind culinary adventure for his guests. 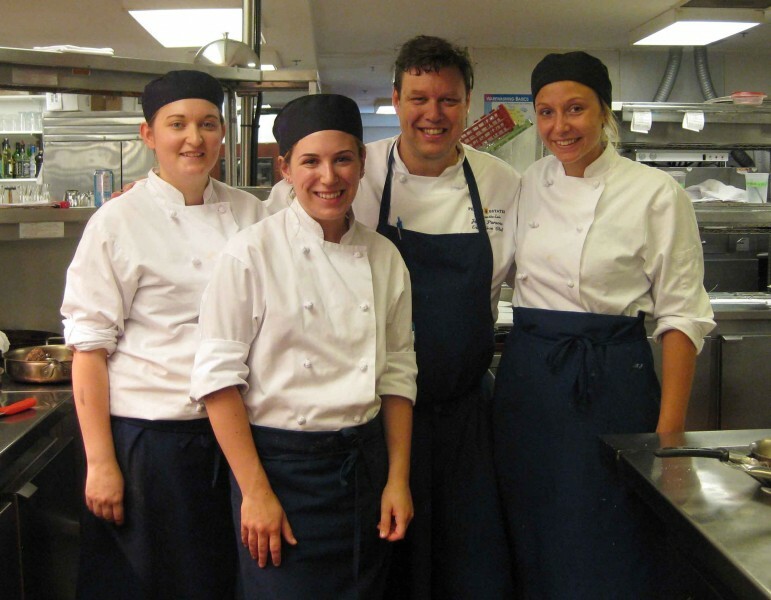 Chef Jason Parsons in the kitchen with his talented young chefs. The style of cuisine at Peller Estates Winery Restaurant is regional; heavily influenced by the food that is available in the Niagara region, which of course includes wine. The meat and produce is 100% Canadian, as much as possible. They have their own pastry department that makes everything in-house. They also craft their own sausages, charcuterie, and ricotta. And before winter hits they pickle and can as much local produce as they can. The chefs have built such close relationships with local farmers they receive calls updating them on what’s ready for harvest. Scott Epp is one of the local farmers who helps keep them stocked with plenty of fresh vegetables with regular deliveries every Tuesday and Friday. In a way the farmers help set the menu – if carrots are in abundance, expect to see them on your plate! Some of the vegetables and herbs found in the dishes come from even closer than the neighbouring farms, since Peller Estates has their own garden. All the chefs are given their own plot of veggies to take care of during the growing season, ensuring they are always in tune with where their ingredients come from. 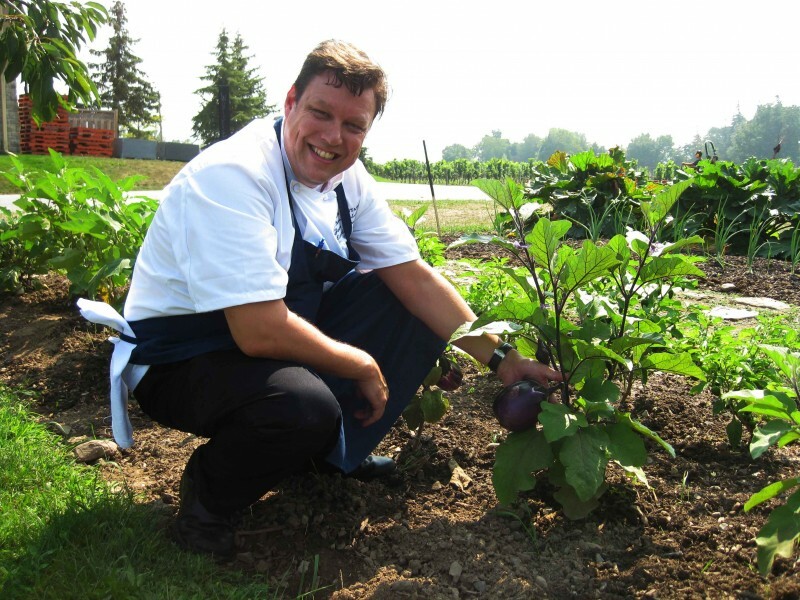 Chef Jason Parsons in the Peller Estates Garden. Chef Parsons has an infectious passion for food. He talks about every ingredient in a way that makes you look at something as familiar as a strawberry and see a new flavour to experience. This enthusiasm explains why they’re all about preserving the integrity of the ingredients at Peller Estates Winery Restaurant. They don’t use many hot peppers or overpowering spices. Instead they opt for herbs and spices that will complement the flavours of the main ingredients on the plate. There is no magical recipe book the chefs follow to come up with their inspired dishes. Rather, their process is free flowing. Often selecting a protein first and building from there. They draw inspiration from the different produce in the region, their own experiences at other restaurants, and the wine at Peller Estates. It is a group process where they often find themselves finishing each other’s sentences. The Peller Estates Winery Restaurant is also doing what it can to help encourage and educate the next generation of Canadian chefs. Every year they take in 3-4 culinary students, with some coming from colleges such as Red River College in Manitoba. Chef Parsons has created the perfect learning environment for young chefs to truly develop their creativity. Every day they sit down, take a look at what ingredients they have and figure out the menu for the day. Chef Maurice Desharnais puts the finishing touch on the main course. 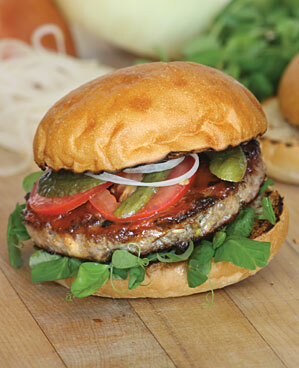 Their Restaurant works hard to showcase the high caliber of Canadian food on the menu. It’s this commitment to quality that put Bothwell Cheese in their dishes. Six years ago Executive Sous Chef Maurice Desharnais was looking for a selection of Cheddar cheese from across Canada, one from each Province to be exact. He tried the Bothwell Maple Smoked Extra Old Cheddar and loved the profile. Its consistent, good taste is what he says makes Bothwell one of the best Cheddars in Canada. Chef Desharnais has since brought in other popular Bothwell varieties such as the Black Truffle, Horseradish Cheddar, and Madagascar Green Peppercorn. 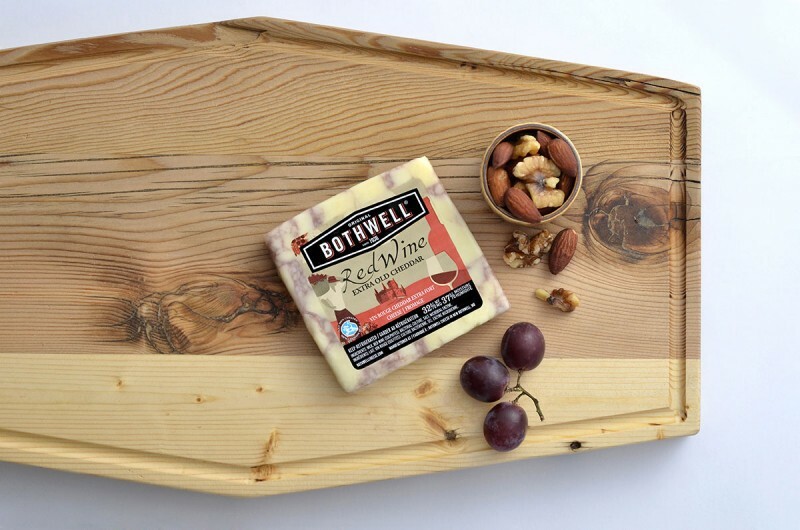 Dishes that feature Bothwell Cheese include their Pulled Pork with Horseradish Cheddar in the summer, and the Maple Smoked Extra Old Cheddar is always on their cheese board. FUN FACT: Bothwell uses Peller Estates Wine in their Red Wine Extra Old Cheddar. Eating at Peller Estates is a true delight, especially for those who love to say “surprise me!” when they sit down at a table. There is no standard menu. The seasonal menu changes five times a year, and the blind menu changes every week. You sit down at a table and choose between a four or five course lunch, and at dinner five or seven courses–complete with wine pairings (obviously!). For a more casual dining experience there is also the newly created Barrel House Grill on the estate. It’s perfect if you missed the dining times at the restaurant, or would just like a quick bite to eat. They also occasionally host dinners on their picturesque vineyard. The wine tours at Peller Estates are fun and informative, including a visit to the vineyard, demonstrations on how to test to see grapes are ready to harvest, and exploring the cellar where they host events like their big New Year’s Eve dinner. One of the most unique features at the winery is the 10Below Icewine Lounge which is the best way to be introduced to Icewine. The room, which is literally built of ice, was created because -10° C is the temperature at which the grapes used to make Icewine are harvested. Well-known for its Icewine production, the Niagara Region celebrates their craft each January with the Niagara Icewine Festival–when many wineries hold their own special events. 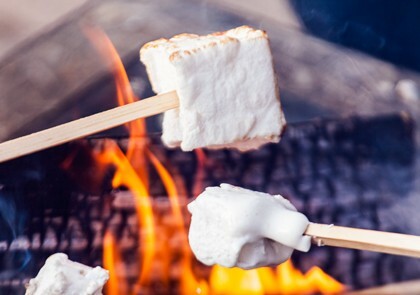 Peller Estates is infamous for their Icewine marshmallows, which they make from scratch. With 2 people on marshmallow duty for 8 hours a day, they make about 718,000 marshmallows throughout the festival! 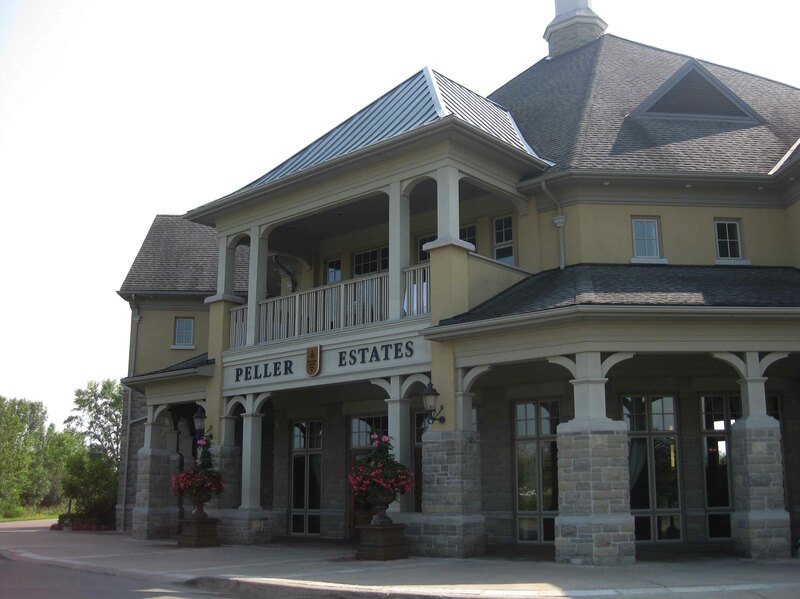 With its fine wine and good food, Peller Estates Winery is a tribute to the gifts of the Niagara region. Its passionate chefs have worked hard to honour this beautiful place with food that is crafted from the fruits of its soil and inspired by its wines that are the lifeblood of the land. They’ve truly captured the humble beauty of the Niagara region, and it would be their pleasure to share its abundance and beauty with you.